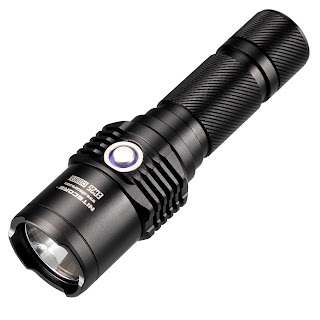 NITECORE EC25 "Cobra" The Ultra-high Intensity Palm-Sized Searchlight, officially launches on 14 December, 2012. The Nitecore EC25, maximum output of 860 lumens (ANSI/NEMA FL1), The EC25’s lightweight and diminutive body allows it to be carried in a pocket making it the perfect companion for hiking, camping, hunting, search & rescue or professional duty light. The EC25 also features ‘Precision Digital Optics Technology', whereby computer simulation and precise point-to-point curved reflecting methods ensure optimal reflector performance. This translates to an even, full-coverage beam capable of illuminating targets at up to 222 meters (ANSI / NEMA FL1).The EC25 is powered by ONE 18650 battery and features Five brightness levels plus Strobe / SOS modes and a ‘Location Beacon’ function. With its versatile feature set, ultra-high-intensity beam and extremely compact size, the Nitecore Cobra EC25 palm-sized Searchlight is the ultimate lighting tool for both outdoor enthusiasts and working professionals. You can buy the NITECORE EC25 in our online store just now!